Landing: March 9 @ approx. 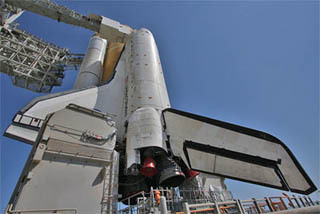 11:57 a.m.
Space shuttle Discovery's 50-foot-long robotic arm has been cradled back into the payload bay and powered down, completing the orbiter's final use of its Canadian-built arm. The Orbiter Boom Sensor System has been berthed in the payload bay, its job complete for the mission. Analysts on the ground will be examining all of the imagery gathered and should have the heat shield cleared of any concern tomorrow. The heat shield surveys have been completed for Discovery's mission. The crew will be putting the inspection boom in its cradle in the payload bay shortly. Observations of the port wing are now underway aboard shuttle Discovery by commander Steve Lindsey, pilot Eric Boe and mission specialist Al Drew. This is the third and final part of the inspections for today. Discovery's reinforced carbon-carbon nose cap has been surveyed as the astronauts use the Orbiter Boom Sensor System on the end of the shuttle's robot arm for a series of heat shield inspections. The scans are similar to the ones performed the day after launch. Today's survey results will be compared with the earlier data to ensure the orbiter's wing leading edge panels and nose cap are free of any space debris impacts that could have happened during the mission. The right wing has been scanned using the laser and camera package of the Orbiter Boom Sensor System. The crew is swinging the boom in position to inspect Discovery's nose cap next. The starboard wing surveys are getting started. The crew has the inspection boom in motion for today's heat shield inspections. The shuttle is quickly departing the vicinity of the space station following separation burn No. 2 producing a 3 feet per second change in velocity. The astronauts will spend the rest of their workday using the Orbiter Boom Sensor System to inspect the shuttle's wing leading edge panels and nose cap to look for any space debris or micrometeoroid damage that could have occurred during the mission. Standard day-before-landing tests of Discovery's flight controls and thrusters, along with packing up the cabin for entry will fill the crew's Tuesday in orbit. Landing at the Kennedy Space Center to conclude this spaceflight is scheduled for Wednesday at 11:57 a.m. EST. A backup landing opportunity is available an orbit later at 1:34 p.m. EST. The early weather forecast for the Kennedy Space Center calls for acceptable conditions at the landing site. The outlook includes scattered clouds at 3,000 and 20,000 feet, seven miles of visibility, southeasterly winds from 120 degrees of 15 peaking to 21 knots. Discovery is 7,600 feet from the station, separating at 6 feet per second. Over 6,000 feet away now, opening at 6.15 feet per second. Now 4,300 feet between the two spacecraft, separating at 5.69 feet per second. Discovery is climbing high above and behind the station. Now 2,100 feet away, separating at 4 feet per second. The shuttle is 1,400 feet from the station and about 20 minutes away from the next engine burn. The shuttle just performed the first of two separation engine firings. This brief burn changed Discovery's speed by about 1.5 feet per second. The space shuttle Discovery is out in front of the International Space Station to complete its full victory lap. Discovery is passing over Italy now as the shuttle continues the station flyaround. The shuttle is beneath the station now, continuing its circle around the complex, as the spacecraft fly over the Atlantic and near the coast of Africa. "Well, it's always neat. I've only done it one other time for myself on my last mission to actually fly around and look at the station so just getting the opportunity to do it at all is truly amazing and the fact that it may be one of the last times that a shuttle gets to go, it's an honor to get the opportunity to do it and I will be appreciating every second, watching it and really just trying to put it in my memory, just like when you're on a vacation and you're watching something that's really neat or going to some other type of event. I will try to record all that in my memory banks so that I can play it back for years to come." The shuttle is reaching a point directly behind the station in terms of the direction of travel of the two spacecraft around the Earth, which is known as the -V bar. The shuttle is descending in its loop around the station. Now about 725 feet away. Discovery is reaching a point about 600 feet directly above the space station. The flyaround started with the shuttle in front of the station. It takes Discovery to a point directly above the complex, then behind it, looping below and back out in front. After climbing above the station for a second time, the final separation engine firing will be performed. This burn will send Discovery away from the vicinity of the station. Distance between the two craft has grown to 505 feet. The spacecraft are passing into an orbital sunrise over the South Pacific. Pilot Eric Boe has begun flying Discovery in a one-lap flyaround of the station. The shuttle is headed to a point more than 400 feet away where it will fire thrusters to begin an arc above the station for today's flyaround. Now 375 feet of separation. Discovery is 236 feet from the station, continuing to separate at 0.27 feet per second. Now 50 feet of separation with Discovery moving away at 0.3 feet per second. "Discovery departing," International Space Station commander Scott Kelly says as he rings the station's bell. Discovery is 20 feet from the station as it slowly backs away. The undocking occurred as the two spacecraft flew 220 miles over the Pacific Ocean, east of Indonesia and northeast of Australia. UNDOCKING! Discovery and the International Space Station are parting company after 8 days, 16 hours and 46 minutes of being linked together high above Earth. The successful visit by the space shuttle delivered and opened the Permanent Multipurpose Module, literally a roomy float-in closet for storage, and installed another outdoor spare parts pallet. Discovery is due home at the Kennedy Space Center on Wednesday, weather permitting, to complete her 39th and final flight. Hooks and latches are driving open. Five minutes from undocking. The steering jets on Discovery are inhibited for the period of physical undocking from the station. The separation occurs when large springs push the two craft apart. Once the shuttle is a couple feet away from the station and the docking devices are clear of one another, pilot Eric Boe will fire Discovery's thrusters to continue the movement away. The spacecraft have passed into an orbital sunset. The undocking will occur in darkness but the later flyaround of the station by Discovery will take place in daylight. "Houston is go for undocking," CAPCOM Steve Robinson just radioed the astronauts. Both the shuttle and station flight control teams report all systems are ready for the undocking at 7:00 a.m. EST. Discovery's guidance system was aligned this morning, the station's giant solar arrays have been positioned to protect them from shuttle thruster plumes and the entire shuttle/station complex was reoriented to the proper attitude for undocking. Throughout the time Discovery has been docked to the space station, the combined stack flew in an orientation with the Russian segment leading the way. This was meant to keep Discovery's heat shield out of the direction of travel. But as undocking approaches, the stack is being turned 180 degrees to enable Discovery to separate and fly out in front of the station, reversing its path to docking nearly 9 days ago. The latest version of the NASA Television schedule (Rev. K) can be downloaded here. The crew of the shuttle Discovery, awakened by actor William Shatner reading a "Star Trek" tribute marking the veteran spaceplane's final voyage, geared up to undock from the International Space Station today to close out an extended assembly and resupply mission, the shuttle's 13th and last visit. With a special musical tribute, the space shuttle Discovery astronauts have been awakened for undocking day. The orbiter will separate from the International Space Station at 7:00 a.m. EST, then begin a one-lap flyaround of the outpost. Playing the Star Trek theme song with William Shatner narrating: "Space... the final frontier. These have been the voyages of the space shuttle Discovery. Her 30-year mission: to seek out new science, to build new outposts, to bring nations together on the final frontier, to boldly go and do what no spacecraft has done before." Hatch closure was marked at 4:11 p.m. EST, ending 7 days, 23 hours, 55 minutes of open-hatch time between the two spacecraft. The 12 shuttle and station crewmembers are saying their farewells as the Discovery astronauts prepare to float out of the space laboratory and close the hatchway. The orbiter's visit delivered the Permanent Multipurpose Module and Express Logistics Carrier No. 4, performed a pair of spacewalks and helped with internal maintenance. The Discovery astronauts will bid farewell to their space station crewmates in live ceremony a few minutes from now. The hatchway will between the two spacecraft will be closed this afternoon in preparation for Discovery's undock tomorrow morning. The latest version of the NASA Television schedule (Rev. J) can be downloaded here. The space shuttle and station astronauts are awake for their final day together before Discovery departs for home. The crews will spend Flight Day 10 finishing the last transfers of items between the two spacecraft, enjoy a bit of off-duty time around mid-day and then have a farewell ceremony before closing the hatchway for the night. Discovery's actual undocking occurs early Monday morning. The latest version of the NASA Television schedule (Rev. I) can be downloaded here. The wakeup has been given for Flight Day 10 as the Discovery and space station crews begin another joint workday together. On tap today is more offloading of the Permanent Multipurpose Module and maintenance on the station's Oxygen Generation Assembly and the Carbon Dioxide Removal Assembly. It was a fairly quiet day aboard the International Space Station and shuttle Discovery complex while NASA lost its Glory climate satellite during a failed Taurus XL rocket launch from California early this morning and bad weather scrubbed an Atlas 5 booster flight from Florida carrying the U.S. military's second X-37B mini spaceplane. Here's our latest story on the shuttle flight. The Discovery astronauts are focusing on unloading the newly attached Permanent Multipurpose Module, or PMM, today, moving science gear and other equipment into the International Space Station. All 12 shuttle-station astronauts and cosmonauts plan to participate in a joint crew news conference at 10:48 a.m. EST to discuss the progress of Discovery's mission. The latest version of the NASA Television schedule (Rev. H) can be downloaded here. It's wakeup time for the shuttle Discovery astronauts to commence Flight Day 9 of the mission. This is day set aside for the crew to help the International Space Station residents with the laborious job of unpacking the new Permanent Multipurpose Module. Also upcoming today, the joint crews will hold the traditional in-flight news conference at 10:48 a.m. EST. The orbiting astronauts received a presidential phone call. MISSION EXTENDED. Yet another bonus day has been added to space shuttle Discovery mission's the International Space Station, as flight controllers take full advantage of the orbiter's plentiful consumables to keep the crew aboard the lab complex longer to help out with internal work with the new Permanent Mulitpurpose Module. That means Discovery's undocking now occurs on Monday, with landing at Kennedy Space Center next Wednesday at about 11:58 a.m. EST. The space station reboost has been successfully delivered by Discovery's small vernier thrusters. The space shuttle Discovery has begun a 26-minute maneuver using the vernier jets to boost the International Space Station's altitude by 0.9 miles, reaching a new orbit of 224 by 214 statute miles. The latest version of the NASA Television schedule (Rev. G) can be downloaded here. The Discovery astronauts worked through a busy half day in space today, looking forward to off-duty time and an afternoon call from President Obama. The space shuttle Discovery's astronauts have begun Flight Day 8 that will include more work with internal transfers of items between the spacecraft this morning, a series of live television and radio media interviews, then some off-duty time this afternoon. And President Obama will make a live call to the crew from the White House at 5:03 p.m. EST.